It has been several weeks now since I saw Charlie Kaufman's sprawling, borderline impenetrable directorial debut, Synecdoche, New York. I've been letting the film gestate in my mind ever since, partially due to Sony's regional review embargo, and partially because, quite honestly, I just needed time. This is not a film one can comprehensively review anyway, but to do this film justice in a quick, post screening review seems crass somehow. Kaufman has always been known for the innovative complexity of his screenplays for films such as Being John Malkovich, Adaptation, and Eternal Sunshine of the Spotless Mind. But he chose his most ambitious and personal work yet to make his first film as a director. 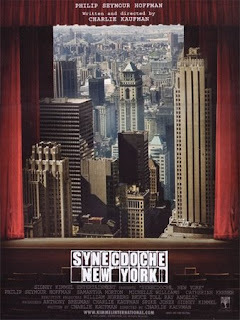 Like Adaptation before it, Synecdoche, New York is a deeply introspective look into the artistic process. This time instead of a screenwriter, Synecdoche sets its sights on a theatrical director named Caden Cotard (Philip Seymour Hoffman), who has just completed a successful (if completely hollow and pretentious) production of Arthur Miller's Death of a Salesman. Burnt out and stuck in a stagnant marriage to a self absorbed artist (Catherine Keener), he begins to see his career as an artistic sell out catering to blue haired suburbanite tourists. He is such a wreck and wash out (in his mind), that he is literally falling apart. Caden wants more than the hand he has been dealt. He wants to find happiness with his wife, he wants to connect with his young daughter, and above all he wants to throw off his creative shackles and create a masterpiece that will capture the truth of life in a way no one has ever seen. But as life has a tendency to do, it refuses to make things any easier. His wife leaves him for an artistic tour of Germany, taking along his beloved daughter, Olive, who is no longer anymore than a stranger with an increasingly screwed up life. He begins to fall for a former ticket taker named Hazel (Samantha Morton), but ends up marrying an actress named Claire (Michelle Williams), who despite his (and her) best efforts, can never live up to Hazel. When Caden receives a 'Genius Grant," he finally sets about to crafting his masterpiece. He buys a giant warehouse and begins to build a life size replica of New York, creating in detail every last place that is important in his life. He hires actors to play himself and everyone he comes in contact with, who follow their real life counterparts everywhere they go in order to better capture their essence on stage. His goal is to make his life a play, and find truth in his existence though theatre he has been unable to find on his own. Caden's endless quest for verisimilitude leads the production to take on an ever increasing level of complexity. Soon he has actors playing the actors who are following the real people around in order to convey his new reality, which isn't really reality at all anymore but a life sized theatrical production that has consumed his entire life for years on end. It is a play with no audience and all actors, where the whole world really is, as Shakespeare once observed, a stage. "There are nearly thirteen million people in the world." He says. "None of those people is an extra. They're all the leads of their own stories. They have to be given their due." Synecdoche, New York is, above all, about the search for meaning in one's life, and the desire to leave a lasting impression on the world when you're gone. But for Caden, his burning desire to convey the truth is the white whale he can never reach - it must either consume him or destroy him, and Kaufman's absurdly comic, achingly melancholy vision manages to be as universal and as all encompassing as the masterpiece that Caden can never finish. Yes it's self indulgent, but I contend that it would be nearly impossible to convey the depth and breadth of the artistic journey without being so. Would it be fair to call Fellini's 8 1/2 self-indulgent? 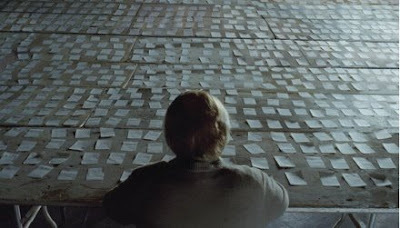 By the same token, Synecdoche opens up and allows the audience to find their own truth. It is a wildly sprawling work whose intricacies and symbolism will be studied by critics and film historians for years to come. I found nothing pretentious or arrogant about it, in fact there is a strange humility to be found in Kaufman's self conscious introspection. This is a portrait of a tortured artist that allows the audience to see themselves through its many dense layers. There is so much here to be reflected on and digested that multiple viewings will continue to divulge its myriad wonders. 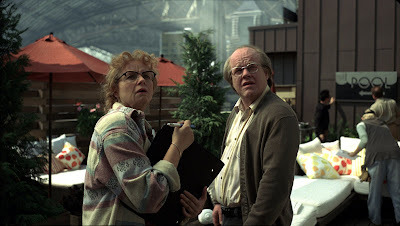 Synecdoche, New York is a voyage of discovery all its own; a cerebral, labyrinthine Rorschach blot that offers those willing to take its journey the chance to discover some of the truth in their own lives. It would be difficult to describe the film as self-assured, because it isn't. It is a difficult, troubled, often deeply sad film. But the film, like its characters, is on a search for answers and meaning that aren't easy to find, and often are to be found in the journey itself. Kaufman may be on the same journey as his characters, but in many ways most of us are too, and perhaps somewhere deep in the heart of this miraculous, enrapturing film, lies a window into ourselves. All we have to do is look. Your long wait to put together a worthy essay on this most challenging of recent films has been rewarded with a superlative review, which frankly is as good as any other I've read here. And it's better, easily than the scattered piece I wrote myself. I particularly loved the "all the world's a stage" comparision, which is most apt for this multi-layered work. Yes, it is as you say "self-indulgent" much like Fellini's 8 1/2, but as you rightly counter, "would that make the Fellini film less fascinating?" Yes indeed, it is absolutely a "deeply introspective look at the artistic process." "The film is a search for meaning in one's life and the desire to leave a lasting impression on the world when you're gone." "SYNECDOCHE, NEW YORK is a voyage all its own; a cerebral, labrinthine Rorschach blot that offers those willing to take its journey the chance to discover some of the truth in their own lives." "It's a difficult, troubles often deeply sad film..."
"Somewhere deep in the heart of this miraculous, enrapturing film, lies a window into ourselves." This is a truly magnificent review, one of your greatest ever. That guy above me, quite simply, took the words out of my mouth. Great review Matty, for sure. I love this frakking movie! Thanks guys! I think the time and distance really helped. I didn't want this to be just another plot summary good/bad kind of review like I often do for the paper. It deserves so much more than that.